The end of winter means the beginning of vivid, green summers. But it also means the arrival of something far less pleasant—severe flooding. When snow starts melting, it’s important to be prepared for the long-term consequences of floods, including increased pest activity. But water isn’t the only problem that comes along with this yearly phenomenon. Pest activity skyrockets during these periods, which is why it’s critical to be prepared for these unwanted nuisances before their arrival. Cover gutters with mesh. This helps prevent debris like leaves from piling up and clogging gutters, eliminating potential places for pests to hide. Repair and maintain window and door screens. Make sure all screens fit tightly and are free of holes. Seal cracks and gaps around the building’s exterior. Did you know that rats can fit through holes as small as a quarter? The rats already know, and they’ll take advantage of their diminutive size to make themselves at home before you ever see them. Eliminate any leftover standing water. Pests are always looking for water sources, and standing water provides an ideal place for them to take up residence. Remove clutter. Bugs and mice are hide-and-seek experts, so they enjoy messy spaces which allow them to crawl in and set up shop undetected. Clean up fallen tree branches and vegetation. Plant debris often serves as a pest haven in the aftermath of a flood. 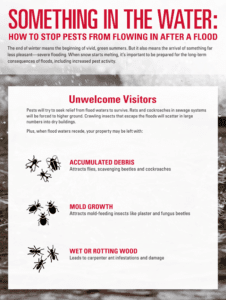 These are just a few of the things you can do before and after a flood to keep pests at bay. Download “Something in the Water – Flooding” for even more details on how to rid yourself of vile visitors after a flood.